Q: On April 19, Cuba's new National Assembly of People's Power officially elected the new national leadership. Raul Castro left the post of head of state and former First Vice President of the Council of State and Council of Ministers Miguel Diaz-Canel was elected as the new President of the Council of State and Council of Ministers. What is your comment? A: China warmly congratulates the election of the new leadership in Cuba and we respect and support the choice of the Cuban people. General Secretary of the CPC Central Committee and President Xi Jinping has sent congratulatory messages to comrade Raul Castro and comrade Miguel Diaz-Canel respectively and Premier Li Keqiang has also sent a message of congratulation to comrade Miguel Diaz-Canel. The Chinese leadership commend the political mutual trust between China and Cuba and stand ready to work with the Cuban leadership to expand and deepen bilateral cooperation and score glorious achievements in China-Cuba friendship in a new era. China and Cuba enjoy profound friendship and a solid basis for cooperation. We sincerely hope that Cuba's path of socialist development can become wider and wider and believe that a responsible Cuba with its own characteristics can continue to utter its loud voice at the world stage. Q: First, do you have any details on the reported "challenge" by the Chinese warships to three Australian ones in the South China Sea early this month? Second, what is your response to the Australian government's view that they have a right to conduct freedom of navigation and will continue to do so in the future? A: With regard to your first question, I do not know what the word "challenge" mentioned by the Australian side refers to. I may refer you to the Ministry of National Defense for relevant information. 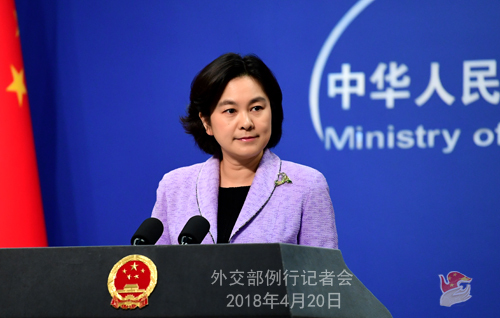 Regarding your second question, China always respects and actively upholds the freedom of navigation and overflight enjoyed by all countries in the South China Sea in accordance with international law. If the Australian side refers to the normal freedom of navigation according to international law, there is no problem with it. If the Australian side has other calculations, we hope that it can see that the situation in the South China Sea now is stabilizing and improving and join hands with China and other regional countries to uphold the peace and stability in the South China Sea and inject more positive energy into this region. Q: First, speaking in London this week, Indian Prime Minister Narendra Modi reportedly described Pakistan as an "export factory of terrorism". What is your comment? Second, the Shanghai Cooperation Organization (SCO) Foreign Ministers' Meeting will be held in Beijing on Monday. Will terrorism be one of the issues that will be discussed? Will China be supportive of moves to get all the SCO members to take steps to crack down terrorism emanating from their soil? A: With regard to your first question, terrorism is the common enemy of the international community, which calls for stronger cooperation through concerted efforts by all parties. We hope that the international community will lend active support to Pakistan's counterterrorism efforts and continue to work with Pakistan to conduct effective cooperation in fighting terrorism. As to your second question, it is the purpose of the SCO to uphold regional security and stability and promote the common development and prosperity of its member states. Since its inception, the SCO has always taken security as a priority for cooperation. The upcoming meeting of the Council of Foreign Ministers of the SCO will be an occasion to exchange views on across-the-board cooperation and major international and regional issues. We hope and believe that all parties will take this meeting as an opportunity to carry forward the Shanghai Spirit, consolidate good neighborliness, solidarity and mutual trust and build up cooperation consensus with a view to promoting new progress of the SCO. Q: Singaporean Prime Minister Lee Hsien Loong said in a signed opinion piece published by the Washington Post on April 18 that unilateral tariffs are not the right solution and will gravely undermine the rules-based multilateral system. In addition, at the Spring Meetings of the International Monetary Fund (IMF) and the World Bank on April 19, Managing Director of the IMF Christine Lagarde urged countries to steer clear from protectionism, saying that unilateral trade restrictions have not been proven helpful and countries should work together to resolve differences over trade. What's your response? A: I have seen these reports and also noted that Prime Minister Lee Hsien Loong said in this article that, the cause of a country's trade deficit lies at home. The trade deficit is the result of a country consuming more than it produces, and it is neither caused nor cured by trade restrictions. 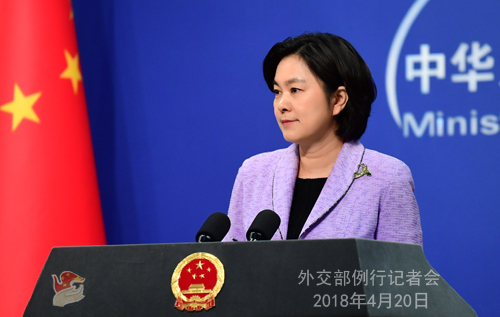 As always, China believes that the trade imbalance indeed needs to be addressed, but we should not make false attribution or wrong prescription. The past experience has repeatedly proved that isolation can only lead to a dead-end alley, and only by opening up and cooperation can the road become wider and wider. As to the China-US trade frictions, we have stated China's position in a clear and firm manner on many occasions. This is a struggle of multilateralism and global free trade against unilateralism and protectionism. The international community should jointly uphold the multilateral trade system with free trade as its cornerstone and promote the sustained recovery of the world economy and global trade. Q: The US-China Economic and Security Review Commission under the US Congress released a report on April 19, claiming that the Chinese government appears to support some corporate espionage designed to improve the competitiveness of Chinese firms while potentially advancing government interests. Huawei, Zhongxing Telecommunication Corporation (ZTE) and Lenovo are three Chinese companies that exhibit some of these characteristics. What is your response to this? A: You mentioned that the US-China Economic and Security Review Commission claimed that the Chinese government "appears to" support some activities. The US side employed "appears to" once again! If all the policies adopted by the US are based on such sheer fabrication with the expression of "appears to", it is nothing but irresponsible and dangerous. I have just read the speech delivered by Chinese Ambassador to the US Cui Tiankai at Harvard University in which he said that recently something has baffled him. Ambassador Cui often asks himself whether the United States is still the open, confident and optimistic country that he used to know? I believe this also confuses many other people. Now the China-US relations are at a crossroads. The future development of China-US relations largely depends on the mindset our two sides choose to view ourselves, the world and our bilateral ties in an ever-changing world. If we were subject to the Cold-War mentality and zero-sum game, there would be traps and plots in our eyes. If we hold a more positive attitude to pursue cooperation, we will grasp the new trend, seize the new opportunity and turn challenges into opportunities to deliver tangible benefits to the two peoples. We hope that certain people in the United States can update their visions of international relations and follow the trend of the times instead of swimming against the tide. Q: What is your response to the reports that the US Treasury is considering ways to restrict sensitive Chinese investments and corporate acquisitions in the US by invoking the emergency powers law and bringing forward security review reforms? A: Recently the US has made a series of moves, now accusing China of forcing American enterprises to transfer technologies, now exclaiming that the development of China's high-tech sectors threatens its national security. In the final analysis, it reveals the US' domineering mentality that nobody but itself is allowed to possess high techs. I have to point out that the US restrictions on the China-US high-tech trade and investment activities on the ground of national security from time to time is apparently an act of protectionism under the disguise of national security. iPhones are now found everywhere in China. We do not think it is a threat. By contrast, a Huawei cellphone bought by an American consumer is seen as a grave threat to national security by certain Americans. As the world's top country with advanced science and technology, has the US really become so fragile? The US is asking China to further open its market on the one hand and repeatedly restricting China's normal trade and investment activities on the other. This conforms to neither the market law nor international rules, still less the principle of fairness, impartiality and reciprocity that the US side is always talking about. I believe we all know it only too well that the US' cracking down on China's scientific and technological development and progress under the pretext of national security actually constitutes an unreasonable act of economic and technological hegemony. The US should be clear that scientific and technological progress shall serve the wellbeing of the whole mankind rather than as a certain country's tool for hegemony. Last year China contributed 57.5% to scientific and technological progress in the world and over 30% of global economic growth. 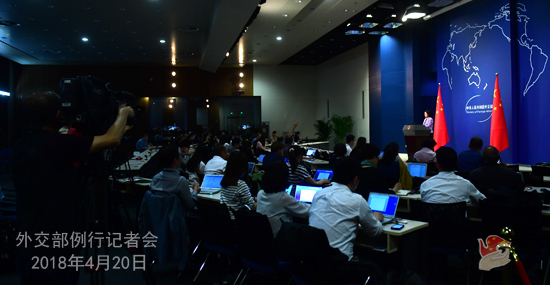 China is now vigorously implementing the strategy of innovation-driven development, and its scientific and technological progress will not be blocked by some noises and disruptions.